The mind of enlightenment, called bodhichitta, is always available, in pain as well as in joy. 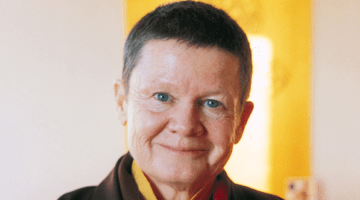 Pema Chödrön lays out how to cultivate this soft spot of bravery and kindness. 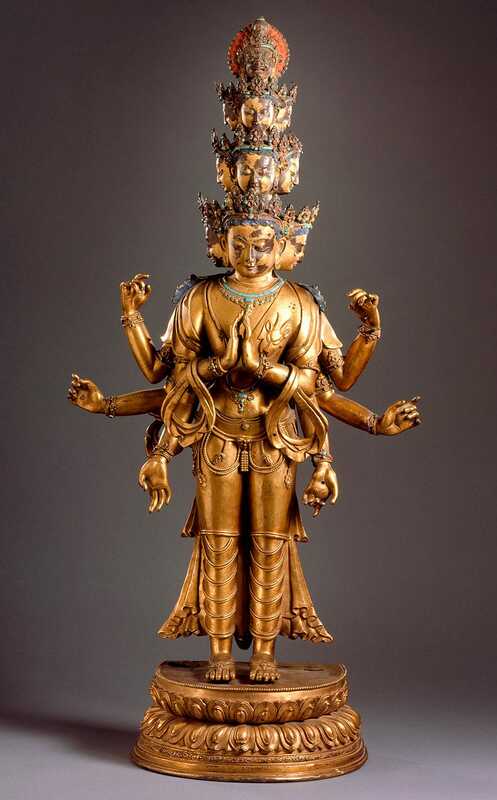 Eleven-Headed Avalokiteshvara. Central Tibet, 16th century Sculpture. Gilt copper alloy with paint, inlaid with turquoise. Image courtesy of the Los Angeles County Museum of Art (LACMA). rightly; what is essential is invisible to the eye. Right there, I received this pith instruction: we can let the circumstances of our lives harden us so that we become increasingly resentful and afraid, or we can let them soften us and make us kinder and more open to what scares us. We always have this choice. If we were to ask the Buddha, “What is bodhichitta?” he might tell us that this word is easier to understand than to translate. He might encourage us to seek out ways to find its meaning in our own lives. He might tantalize us by adding that it is only bodhichitta that heals, that bodhichitta is capable of transforming the hardest of hearts and the most prejudiced and fearful minds. We can learn to seize that vulnerable moment—love, gratitude, loneliness, embarrassment, inadequacy—to awaken bodhichitta. Bodhichitta is also equated, in part, with compassion—our ability to feel the pain that we share with others. Without realizing it we continually shield ourselves from this pain because it scares us. We put up protective walls made of opinions, prejudices and strategies, barriers that are built on a deep fear of being hurt. These walls are further fortified by emotions of all kinds: anger, craving, indifference, jealousy and envy, arrogance and pride. But fortunately for us, the soft spot—our innate ability to love and to care about things—is like a crack in these walls we erect. It’s a natural opening in the barriers we create when we’re afraid. With practice we can learn to find this opening. We can learn to seize that vulnerable moment—love, gratitude, loneliness, embarrassment, inadequacy—to awaken bodhichitta. An analogy for bodhichitta is the rawness of a broken heart. Sometimes this broken heart gives birth to anxiety and panic; sometimes to anger, resentment and blame. But under the hardness of that armor there is the tenderness of genuine sadness. This is our link with all those who have ever loved. This genuine heart of sadness can teach us great compassion. It can humble us when we’re arrogant and soften us when we are unkind. It awakens us when we prefer to sleep and pierces through our indifference. This continual ache of the heart is a blessing that when accepted fully can be shared with all. The Buddha said that we are never separated from enlightenment. Even at the times we feel most stuck, we are never alienated from the awakened state. This is a revolutionary assertion. Even ordinary people like us with hang-ups and confusion have this mind of enlightenment called bodhichitta. The openness and warmth of bodhichitta is in fact our true nature and condition. Even when our neurosis feels far more basic than our wisdom, even when we’re feeling most confused and hopeless, bodhichitta—like the open sky—is always here, undiminished by the clouds that temporarily cover it. Given that we are so familiar with the clouds, of course, we may find the Buddha’s teaching hard to believe. Yet the truth is that in the midst of our suffering, in the hardest of times, we can contact this noble heart of bodhichitta. It is always available, in pain as well as in joy. A young woman wrote to me about finding herself in a small town in the Middle East surrounded by people jeering, yelling, and threatening to throw stones at her and her friends because they were Americans. Of course she was terrified, and what happened to her is interesting. Suddenly she identified with every person throughout history who had ever been scorned and hated. She understood what it was like to be despised for any reason: ethnic group, racial background, sexual preference, gender. Something cracked wide open and she stood in the shoes of millions of oppressed people and saw with a new perspective. She even understood her shared humanity with those who hated her. This sense of deep connection, of belonging to the same family, is bodhichitta. Those who train wholeheartedly in awakening unconditional and relative bodhichitta are called bodhisattvas or warriors—not warriors who kill and harm but warriors of nonaggression who hear the cries of the world. Bodhichitta exists on two levels. First there is unconditional bodhichitta, an immediate experience that is refreshingly free of concept, opinion, and our usual all caught-up-ness. It’s something hugely good that we are not able to pin down even slightly, like knowing at gut level that there’s absolutely nothing to lose. Second there is relative bodhichitta, our ability to keep our hearts and minds open to suffering without shutting down. Those who train wholeheartedly in awakening unconditional and relative bodhichitta are called bodhisattvas or warriors—not warriors who kill and harm but warriors of nonaggression who hear the cries of the world. These are men and women who are willing to train in the middle of the fire. Training in the middle of the fire can mean that warrior-bodhisattvas enter challenging situations in order to alleviate suffering. It also refers to their willingness to cut through personal reactivity and self-deception, to their dedication to uncovering the basic undistorted energy of bodhichitta. We have many examples of master warriors—people like Mother Teresa and Martin Luther King—who recognized that the greatest harm comes from our own aggressive minds. They devoted their lives to helping others understand this truth. There are also many ordinary people who spend their lives training in opening their hearts and minds in order to help others do the same. Like them, we could learn to relate to ourselves and our world as warriors. We could train in awakening our courage and love. There are both formal and informal methods for helping us to cultivate this bravery and kindness. There are practices for nurturing our capacity to rejoice, to let go, to love, and to shed a tear. There are those that teach us to stay open to uncertainty. There are others that help us to stay present at the times that we habitually shut down. Wherever we are, we can train as a warrior. The practices of meditation, loving-kindness, compassion, joy, and equanimity are our tools. With the help of these practices, we can uncover the soft spot of bodhichitta. We will find that tenderness in sorrow and in gratitude. We will find it behind the hardness of rage and in the shakiness of fear. It is available in loneliness as well as in kindness. Many of us prefer practices that will not cause discomfort, and at the same time we want to be healed. But bodhichitta training doesn’t work that way. A warrior accepts that we can never know what will happen to us next. We can try to control the uncontrollable by looking for security and predictability, always hoping to be comfortable and safe. But the truth is that we can never avoid uncertainty. This not knowing is part of the adventure, and it’s also what makes us afraid. Bodhichitta training offers no promise of happy endings. Rather, this “I” who wants to find security—who wants something to hold on to—can finally learn to grow up. The central question of a warrior’s training is not how we avoid uncertainty and fear, but how we relate to discomfort. How do we practice with difficulty, with our emotions, with the unpredictable encounters of an ordinary day? All too frequently, we relate like timid birds who don’t dare to leave the nest. Here we sit in a nest that’s getting pretty smelly and that hasn’t served its function for a very long time. No one is arriving to feed us. No one is protecting us and keeping us warm. And yet we keep hoping mother bird will arrive. But by love alone is healed. This is an ancient and eternal law. Thousands of people chanted and wept, knowing that the truth in these words was even greater than their suffering. Bodhichitta has this kind of power. It will inspire and support us in good times and bad. It is like discovering a wisdom and courage we do not even know we have. Just as alchemy changes any metal into gold, bodhichitta can, if we let it, transform any activity, word or thought into a vehicle for awakening our compassion. At one time the Buddha gathered his students together at a spot called Vulture Peak Mountain. Here he presented some revolutionary teachings—teachings on the wide open, groundless dimension of our being—known traditionally as shunyata, as unconditional bodhichitta, as prajnaparamita. The Buddha had already been teaching on groundlessness for some time. Many of the students there on Vulture Peak Mountain had a profound realization of impermanence and egolessness, the truth that nothing—including ourselves—is solid or predictable. They understood the suffering that results from grasping and fixation. They had learned this from Buddha himself; they had experienced its profundity in meditation. But the Buddha knew that our tendency to seek solid ground is deeply rooted. Ego can use anything to maintain the illusion of security, including the belief in insubstantiality and change. So the Buddha did something shocking. With the prajnaparamita (perfection of unconditional wisdom) teachings, he pulled the rug out completely, taking his students further into groundlessness. He told the audience that whatever they believed had to be let go, that dwelling upon any description of reality was a trap. This was not comfortable news for the audience to hear. It reminds me of the story of Krishnamurti, who was raised to be the avatar by the Theosophists. His elders continually told the other students that when the avatar manifested fully, his teachings would be electrifying and revolutionary, shaking up the very foundations of their beliefs. This turned out to be true, but not quite in the way they had imagined. When Krishnamurti finally became head of the Order of the Star, he called the whole society together and officially disbanded it, saying that it was harmful because it gave them too much ground. Any conclusions we might draw must be let go. The Vulture Peak experience was something like that for the Buddha’s students. It wiped away all their existing conceptions about the nature of reality. The Buddha’s principal message that day was that holding on to anything blocks wisdom. Any conclusions we might draw must be let go. The only way to fully understand the bodhichitta teachings, the only way to practice them fully, is to abide in the unconditional openness of the prajnaparamita, patiently cutting through all our tendencies to hang on. During this teaching, known as The Heart Sutra, the Buddha actually didn’t say a word. He went into a state of deep meditation and let the bodhisattva of compassion, Avalokiteshvara, do the talking. This courageous warrior, known also as Kuan-yin, expressed his experience of the prajnaparamita on behalf of the Buddha. His insight was not based on intellect but came through his practice. He saw clearly that everything is empty. Then one of the principal disciples of the Buddha, a monk named Shariputra, began to question Avalokiteshvara. This is an important point. Even though a great bodhisattva was teaching and the Buddha was clearly in charge, the profound meaning emerged only through questioning. Nothing was taken complacently or on blind faith. Avalokiteshvara answered with the most famous of Buddhist paradoxes: “Form is emptiness, emptiness also is form. Emptiness is no other than form, form is no other than emptiness.” When I first heard this, I had no idea whatsoever what he was talking about. My mind went completely blank. His explanation, like the prajnaparamita itself, is inexpressible, indescribable, inconceivable. Form is that which simply is before we project our beliefs onto it. The prajnaparamita represents a completely fresh take, an unfettered mind where anything is possible. Prajna is the unfiltered expression of the open ear, open eye, open mind that is found in every living being. Thich Nhat Hanh translates the word as “understanding.” It’s a fluid process, not something definite and concrete that can be summed up or measured. This prajnaparamita, this inexpressibility, is our human experience. It is not particularly regarded as a peaceful state of mind, or as a disturbed one. It is a state of basic intelligence that is open, questioning and unbiased. Whether it comes in the form of curiosity, bewilderment, shock or relaxation isn’t really the issue. We train when we’re caught off guard and when our life is up in the air. We train, as Trungpa Rinpoche said, in “not afraid to be a fool.” We cultivate a simple direct relationship with our being—no philosophizing, no moralizing, no judgments. Whatever arises in our mind is workable. When we perceive form as empty, without any barriers or veils, we understand the perfection of things just as they are. So when Avalokiteshvara says, “Form is emptiness,” he’s referring to this simple direct relationship with the immediacy of experience—direct contact with blood and sweat and flowers; with love as well as hate. First we wipe away our preconceptions and then we even have to let go even of our belief that we should look at things without preconceptions. We keep pulling out our own rug. When we perceive form as empty, without any barriers or veils, we understand the perfection of things just as they are. One could become addicted to this experience. It could give us a sense of freedom from the dubiousness of our emotions and the illusion that we could dangle above the messiness of our lives. But “emptiness also is form” turns the tables. Emptiness continually manifests as war and peace, as grief, as birth, old age, sickness, and death, as well as joy. We are challenged to stay in touch with the heart-throbbing quality of being alive. That’s why we train in the relative bodhichitta practices of the four limitless ones and tonglen. They help us to fully engage in the vividness of life with an open, unclouded mind. Things are as bad and as good as they seem. There’s no need to add anything extra. So we meditate and contemplate this question; we discuss it with our friends. Next time we see the Buddha we say, “I think I can answer your question. Everything is both empty and not empty simultaneously.” And he says, “No.” Believe me, we’re feeling very groundless and that means rattled. It’s uncomfortable not to be able to get ground under our feet. But the process here is of unmasking: even though we’re irritated and anxious, we’re moving closer to seeing the true unfixed nature of mind. Since “No” is all we can get out of the Buddha, we go home and spend the next year trying to answer this riddle. It’s like a Zen koan. Eventually, we return and say, “Okay. There’s only one other possible answer. The nature of reality is that it neither exists nor doesn’t exist. It is neither form nor emptiness.” And we feel good! It’s a beautiful groundless answer. But the Buddha says, “No, that’s too limited an understanding.” Maybe at this point his “No” is such a shock that we experience the wide-open mind of prajnaparamita, the mind that is satisfied with no resting place at all. 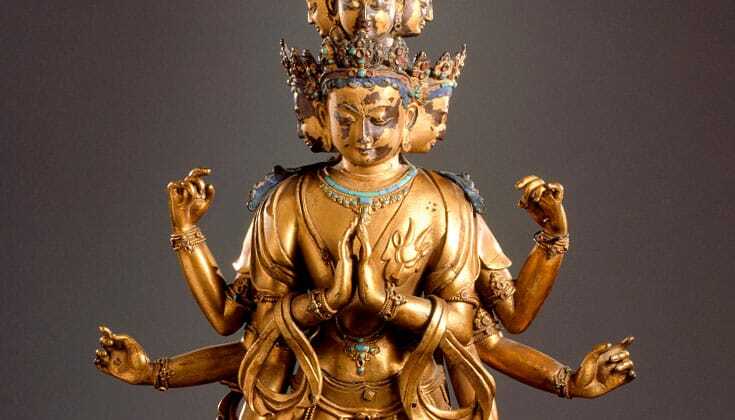 After Avalokiteshvara told Shariputra that “form is emptiness; emptiness also is form,” he went even further, pointing out that there is nothing—not even the Buddha’s teachings—to hold on to: no three marks of existence, no suffering, no end of suffering, no imprisonment, no liberation. The story goes that many of the students were so dumbfounded by these teachings that they had heart attacks. A Tibetan teacher suggested that more likely they just got up and walked out of the talk. Like the Theosophists with Krishnamurti, they didn’t want to hear this. Just like us. We don’t like to have our basic assumptions challenged. It’s too threatening. Now if this teaching had come only from Avalokiteshvara, the students might have been able to rationalize their fears. “This is just a warrior on the path, not so different from us. He’s very wise and compassionate, of course, but he has been known to get things wrong.” But the Buddha was sitting right there in deep meditation, clearly pleased with this presentation of how to abide in the prajnaparamita. There was no way out of this dilemma. When our mind is free of warring emotions and the belief in separateness, then we will have no fear. This instruction on prajnaparamita is a teaching on fearlessness. To the extent that we stop struggling against uncertainty and ambiguity, to that extent we dissolve our fear. The synonym for total fearlessness is full enlightenment—wholehearted, open-minded interaction with our world. Meanwhile we train in patiently moving in that direction. By learning to relax with groundlessness, we gradually connect with the mind that knows no fear. Then Avalokiteshvara proclaimed the pith of the prajnaparamita, the essence of the rug-pulling-out experience, the essence of the fearless, open state of mind. It came in the form of a mantra: “OM GATE GATE PARAGATE PARASAMGATE BODHI SVAHA.” Just as a seed contains the tree, this mantra contains the entire teachings on abiding in prajnaparamita, abiding in the fearless state. 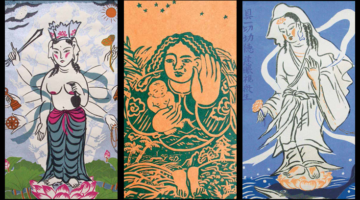 No matter where we are on the bodhisattva path, whether we are just beginning or we’ve practiced for years, we’re always stepping further into groundlessness. Enlightenment is not the end of anything. Enlightenment, being completely awake, is just the beginning of fully entering into we know not what. When the great bodhisattva finished teaching, the Buddha came out of his meditation and said, “Good, good! You expressed it perfectly, Avalokiteshvara.” And those in the audience who hadn’t walked out or died from heart attacks rejoiced. They rejoiced at hearing this teaching on stepping beyond fear. From “The Places That Scare You: A Guide to Fearlessness in Difficult Times.” ©2001 by Pema Chödrön. Used by permission of Shambhala Publications.